Fitzgerald and his men left Fort McPherson, with fifteen dogs, three sleds and enough food for thirty days. The men felt no need to question whether they would reach their destination or not. They successfully completed the first leg of the journey and hired native Esau George to lead them through the next section. When he had completed his part of the trip, Fitzgerald let George go, trusting in Carter to lead them successfully to their destination. Unfortunately, Carter had been on only one patrol, in the opposite direction, and would soon prove to be an inefficient guide. 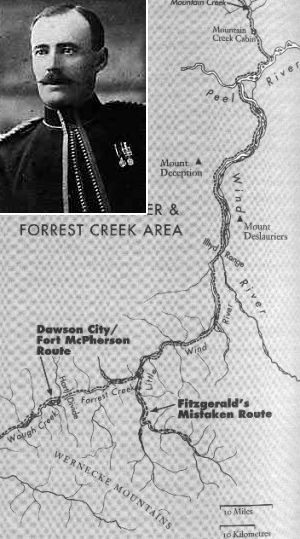 By January 12, 1911, the patrol was lost for Carter was unable to find Forrest Creek which would lead them to Dawson. The team unsuccessfully travelled up and down several streams in search of the correct one. With only four days of regular rations remaining, Fitzgerald made a notation in his journal: “My last hope is gone…I should not have taken Carter’s word that he knew the way from the Little Wind River.” The following day, the patrol reversed their trail in the hopes of returning to Fort McPherson. The trip back to McPherson proved to be difficult. Weak from lack of food and exhaustion, the team were able to walk only a few miles a day, sometimes not at all due to increment weather conditions. Starving, frostbitten and ill, the patrol trekked on. Between January 19 and February 5, ten of the dogs were killed for food. February 5, 1911, day 47 of this fatal patrol, was the date of the last entry in Inspector Fitzgerald’s diary. In Dawson, the Fitzgerald patrol was more than a month late in reaching their destination.. Anxiously, a relief patrol was sent to locate the Mounties. Accompanying Corporal William John Dempster were ex-Constable Frederick Turner, Constable Jerry Fyfe, and Charles Stewart, a Métis from Fort McPherson. They left Dawson on February 28, 1911. On March 21, the lost patrol was found, apparently on their way back to Fort McPherson. Kinney and Taylor were dead, side by side at an open camp, Kinney of starvation and Taylor of a fatal, self-inflicted bullet wound in his head. The next day, Fitzgerald and Carter were found. Having left the other two in search of help, they finally succumbed to the cold and hunger, just 40 kilometres away from Fort McPherson. They would never find help. Why did this patrol fail? Although no single, conclusive answer can be given, several factors contributed. 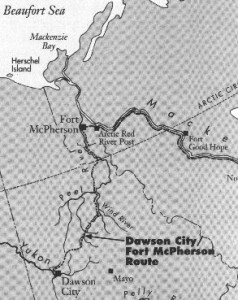 Although Carter had made the trip once, and convinced himself and Fitzgerald he was competent, he did not in fact know the route from Fort McPherson to Dawson. After becoming lost, the team spent much time attempting to find the proper stream to follow. With temperatures that winter between -45 and -62 degrees Fahrenheit, and food sources of limited supply and nutritional value, the patrol was doomed to fail. By the time they were missed at Dawson City, and a search party was sent out, it was too late.